Recently the U.S. Senate considered two bills related to immigration enforcement. Both bills were introduced in response to the death of Kate Steinle who was shot while walking on a pier in San Francisco last year. Reports indicate the man who shot Steinle, Juan Francisco Lopez-Sanchez, was not aiming at her but was firing recklessly and the bullet ricocheted. Lopez-Sanchez is an undocumented immigrant. 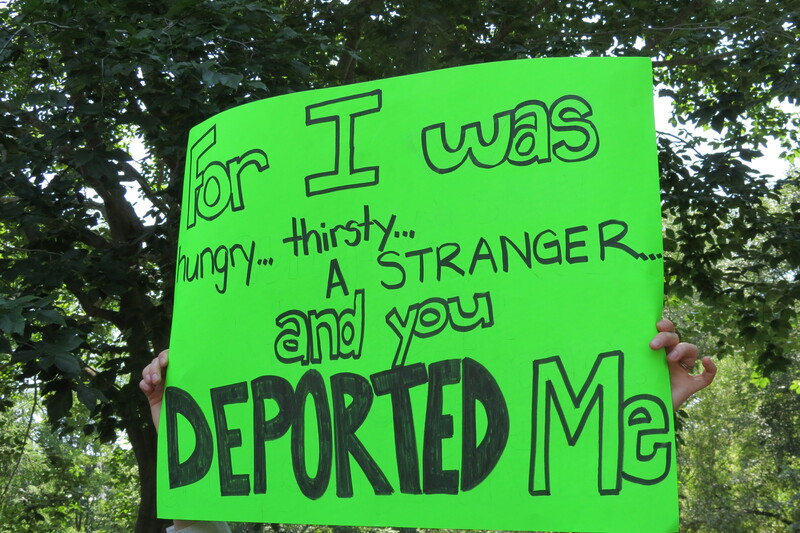 Faith leaders and immigrant rights advocates rallied for #Not1More deportation outside the White House on July 31, 2014. The controversy that followed centered around whether local police should have held Lopez-Sanchez for Immigration and Customs Enforcement (ICE) officials after he finished serving a prison sentence earlier that year. More than 300 local jurisdictions, including San Francisco county, will not hold someone in jail merely because the person is an undocumented immigrant (being undocumented is not a criminal offense). One of the bills debated in the Senate, S. 3100, would have forced local jurisdictions to comply with these “ICE holds” lest they lose federal funding for other operations. The jurisdictions who do not comply with ICE holds argue that individuals who have posted bail, have not been charged with a crime, or have served their prison sentence should not be held further merely due to their immigration status. Many local law enforcement groups object to carrying out immigration enforcement duties because doing so can lead undocumented immigrants in their communities to fear reporting crimes or interacting with the police in any way. Community members might be afraid to call 911 to report a house being broken into, be hesitant to serve as a witness to a violent crime, or be afraid to report domestic violence because doing so could put them or their family at risk of deportation. Should an immigrant be treated differently when it comes to matters of criminal law? Exodus 12:49 states: “There shall be one law for the native and for the alien who resides among you.” If a judge has determined that an individual can be released on bail, why should an immigrant be considered inherently more dangerous than a U.S.-born person? If an immigrant has finished serving a prison sentence, why should that individual be punished more severely than his/her U.S.-born counterpart? The second bill considered last week, S. 2193, would have increased prison time for undocumented immigrants who have previously been deported and try to reenter the U.S. Many of those deported had been in the U.S. for several years and have spouses and children they seek to reunite with. What public safety goal is served by putting them in prison? Some members of Congress are unfortunately using tragic stories such as the death of Kate Steinle to push for anti-immigrant legislation under the guise of enhancing public safety. Such policies do not improve public safety, but instead make communities less safe for everyone. Contact your members of Congress today, share this article, and encourage them to oppose such policies. Tammy Alexander is senior legislative associate for domestic affairs in the MCC U.S. Washington Office. Story originally published on July 22, 2016. Reprinted with permission from Third Way Cafe.